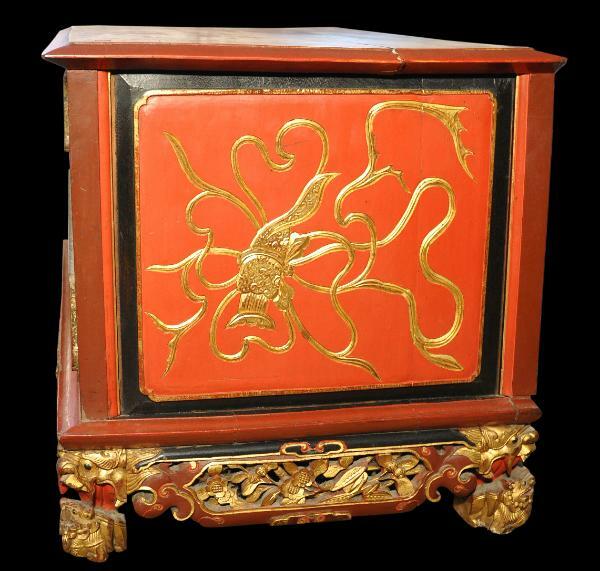 This superb pair of ‘red and gold’ wedding chest-of-drawers is principally noteworthy because it is a pair. 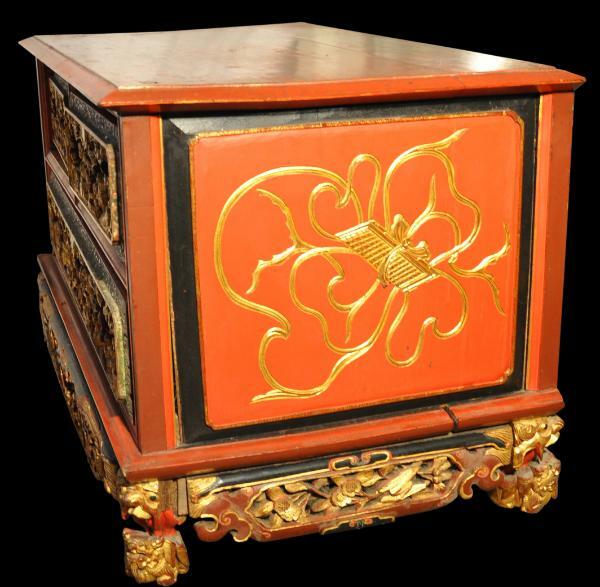 Straits Chinese wedding chest-of-drawers are rare. Proper, matched pairs are all the more rare. 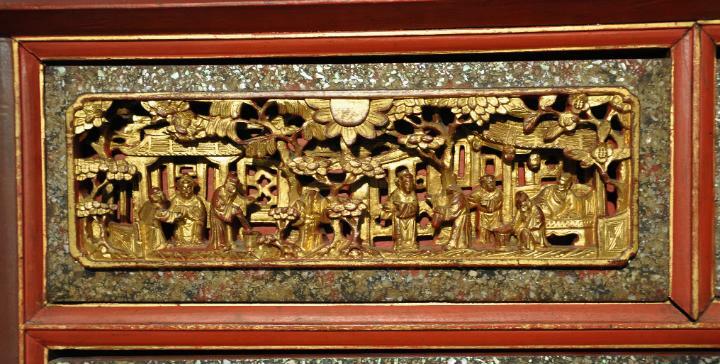 The Romance of the Three Kingdoms, lacquered mostly in red with some brown and gilded. The carved panels are surrounded by frames of green that have been embedded with mica chips. 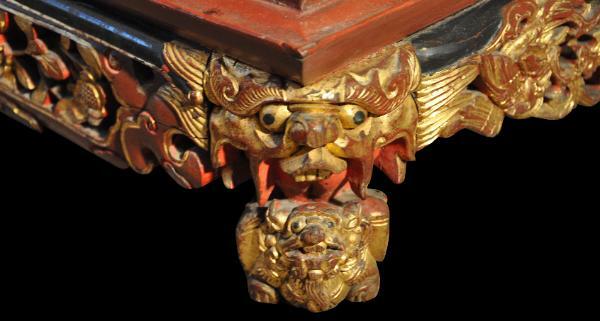 fo-dog type creatures, with elaborate gilded floral and foliage lower aprons to the front and sides which are similarly carved with classical scenes. The front lower aprons also are carved with pairs of phoenixes – a motif much beloved by the Straits Chinese for use in wedding paraphernalia. babas and nonyas and also as the peranakan) were distinctive from most of the Chinese on the Malay peninsular at that time. Their families had been on the peninsular for at least several generations and often they were the product of intermarriage between local Chinese and Malay population. Their customs were a curious blend of English, Malay and Chinese customs. Weddings were very important. 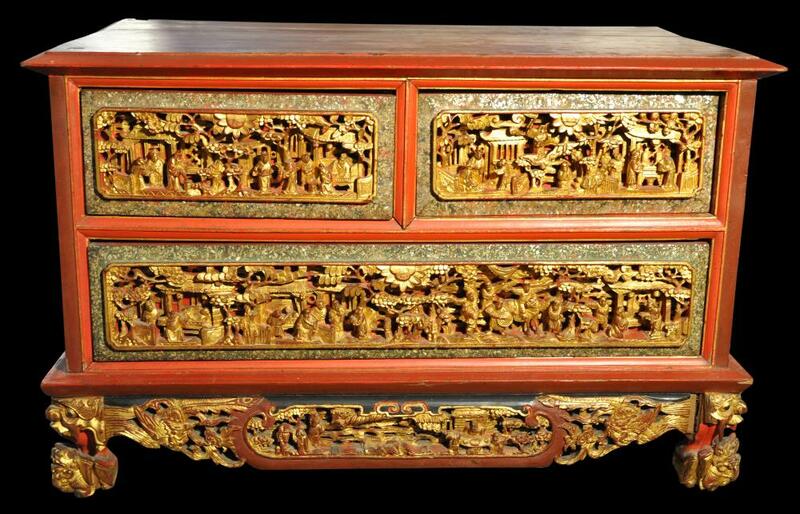 For these, furniture for the bridal chamber often was commissioned from China. 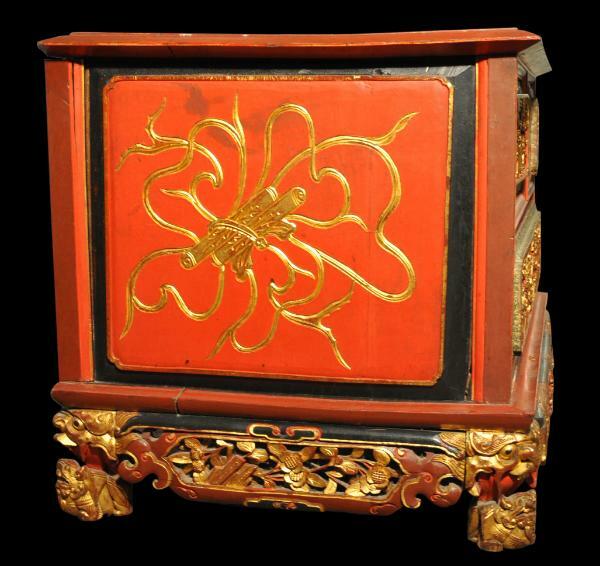 An example of a Straits Chinese wedding chest-of-drawers is illustrated in Ho (1994, p. 106). The two chests were acquired in the UK and almost certainly have been in the UK since colonial times. They are in good, robust condition. There are some time-related losses to the detail of the carvings – some of the small characters have lost their heads for example. There are some shrinkage-related gaps to the main panels (although not as much as other extant examples), and there are some losses to the corner feet. But all the railings are present and original. Indeed, the chests are in no way composite or have replacement parts. Repair work would remedy any issues but may not be warranted: the rarity of a matched pair makes the two exceptional in any event, and the general profusion and detail of the work means that the losses are only apparent with close examination. 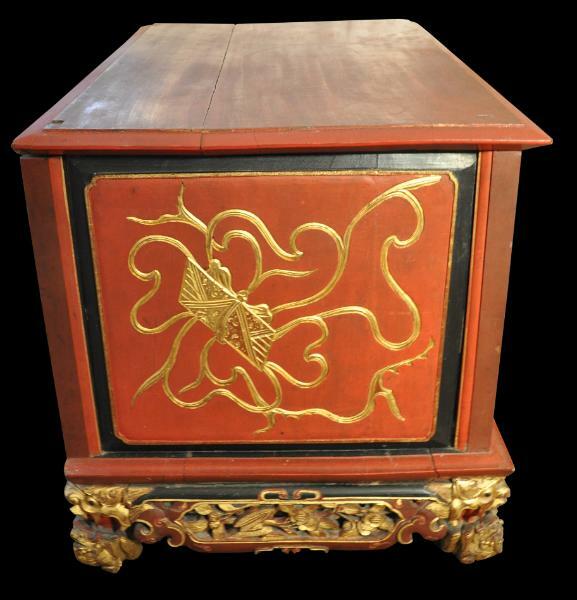 The chests are stable and readily usable in their current state, and are free of any apparent restoration. Ho, W.M., Straits Chinese Furniture: A Collector’s Guide, Times Books International, 1994.